To keep the duck legs extra moist, Chef Evans adds a bit of chicken or duck stock to the baking sheet, but just enough so that the skin still gets beautifully crisp. (You can also make homemade duck confit.) 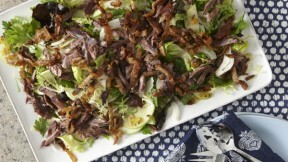 Thyme and duck just go together, says Evans, who liberally adds the fresh leaves, along with parsley, to this hearty salad. Recipe courtesy of Pete Evans. Position a rack in upper third of the oven and heat the oven to 450°. In a medium bowl, combine the mustard, vinegar, honey, and thyme. While whisking add the oil in a slow, steady stream until emulsified. Season to taste with salt and pepper. Place the duck legs, skin-side up, on a large rimmed baking sheet. Bake until the skin is deep golden brown and crisp, and the duck is heated through, rotating the sheet halfway through baking, about 25 minutes. Remove the legs as they are ready and set aside to cool. When cool enough to handle, remove the skin and slice into 1/4-inch thick strips and set aside. Shred the meat into bite-size pieces and transfer to a large bowl. Season to taste with salt and pepper. Transfer half of the meat to small bowl and set aside. Add the greens, fennel, apple, parsley, raisins, and sunflower seeds to the duck in the large bowl. Add the dressing and toss gently to coat. Season to taste with salt and pepper. Transfer to a large serving platter and top with the reserved shredded duck meat and the duck skin.